The CP3100 Jack Panel is used as an interface between different units in the aircraft’s intercom system. It serves the function of an amplifier and connects microphones, headphones, audio selectors and intercom units. The CP3100 is designed as a mono-block device, secured by 4 DZUS fasteners. 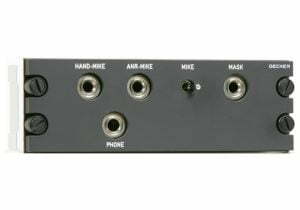 The front plate includes all operating elements like switches and sockets for microphones, headphones, etc.